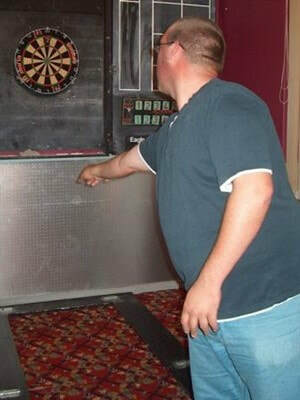 Not only open to big blokes with rotund tums, our chummy darts squad have some lady members and a few thin but beady eyed, steady handed souls. The local Enfield & Cheshunt Associate League, of which we are in the top section play matches on a Friday evening and training nights are whenever more than two of us fancy a pint at the club. It is not absolutely essential that you like Pink Floyd or Sea Sick Steve or be a Blues fan but it might kinda help because you won't get teed off with the last burst of music before going home.